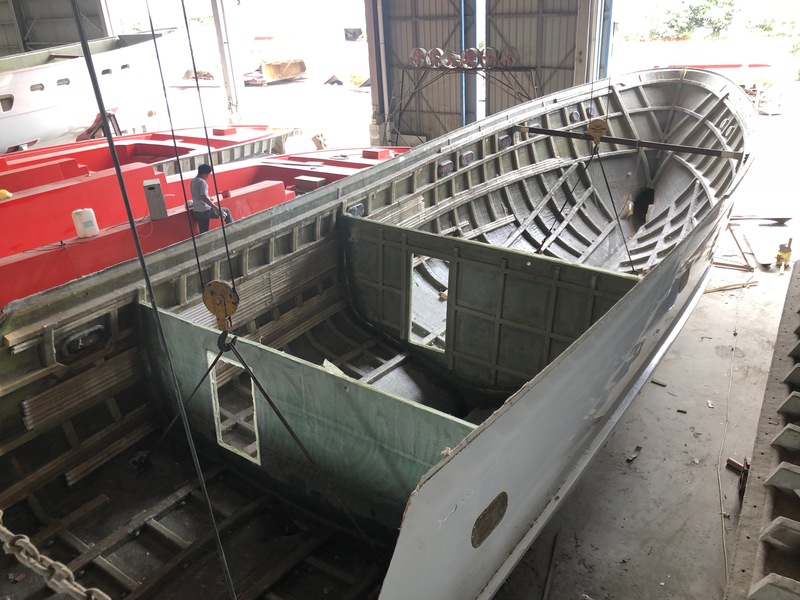 Selene 60 Classic hull N°43 released from its mould - Selene Ocean Yachts The hull of a brand new Selene Classic 6043 (hull n°43) was just released from its mould at the Zhuhai shipyard. The hull of a brand new Selene Classic 6043 (hull n°43) was just released from its mould at the Zhuhai shipyard. The owners came from Europe with their camera and drone to celebrate the happy event! The plan of the lucky couple is to spend ten years sailing around the world! Both owners are experienced mariners with many nautical miles on their logbook aboard their high tech 40’ sailboat moored in Greece. The Selene 60 Classic features a full-height engine room, separate crew quarters aft with a transom door. An expansive and functional flying bridge layout. One of the unique selling points of the Selene 60 Classic is its full-height commissary, or utility room, that is placed between the owner’s cabin and the engine room for storage, freezer, washer/dryer and access to the electrical compartment. This commissary is an even better isolator of the engine room noise into the master cabin! Behind the « walk through » engine room you find the lazarette, which is so spacious that you can easily store your tools, spare parts and diving equipment. 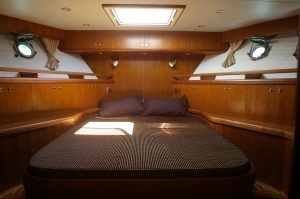 This roomy lazarette also offers the possibility of building a crew-cabin with head. Built to Lloyd’s Category A standards, the Selene 60 Classic has the range, strength, and stability to cross oceans, yet with a moderate draft it is also at home in shallow tropical waters or for gunk-holing rivers and creeks. 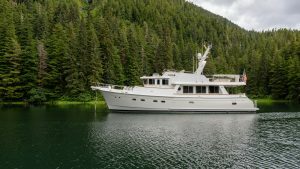 Another couple, Carl and Melody Gulledge, are also the proud owners of Ellipsis, a Selene 60 which also serves as their home. Not a home from home, mind you, but their home! Carl and Melody are an amazing couple who have had several lives… But their past does not define them at all. And certainly does not define who they are today: a wife and husband team living the dream and constantly challenging boredom and routine. And beside that, Carl is an amazing photographer! Read the full story!